Of the 9 billion (yes, that's "billion" with a "B"') land animals slaughtered for meat every year in the U.S, about 8.5 billion of them are chickens. And well over 90 percent of them are raised in absolutely atrocious conditions. Those raised for meat live their short lives entirely indoors, never seeing grass or sun or sky, crowded so tightly that each chicken, with a wingspan of 2½ feet, has on average less than a square foot in which to live its life. Their droppings are not cleaned, so they spend their entire lives in their own filth. As a result of the ammonia, dust, and disease in the air, farmers complain of sore eyes, coughing, and even chronic bronchitis, and have been warned to avoid entering these areas. If that's true for the farmers, what must it be like for the chickens, who must live their entire lives breathing this air? They all develop respiratory problems as a result, and the ammonia burning their eyes sometimes leads to blindness. Farmers use hormonal and genetic manipulation to make the chickens grow seven times faster than normal, which puts such stress on their bodies that 90% of the chickens suffer leg deformities, and some just flip over in convulsions and die. Though their normal lifespan is 15-20 years, they are slaughtered at just 7 weeks of age, because if allowed to grow longer, mortality rates surge due to heart attacks, infections, and other diseases. Chickens raised for their eggs have it even worse. 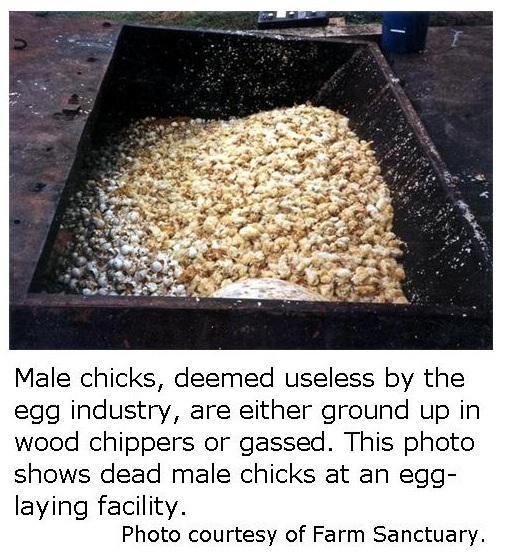 Male chicks are useless to the egg industry, so after they are hatched, one of three things happens: They are simply thrown into plastic bags where they suffocate under one another, they are put into a gas chamber, or they are thrown alive into grinders. The females are raised in wire cages stacked one on top of the other. Anywhere from 4 to 7 birds are packed into a cage the size of a folded newspaper. They cannot stand or perch comfortably on the unnatural slanted wire floor. The result is severe discomfort and serious leg deformities, and their nails can get caught in the wiring, leaving them completely immobile. It is typical for one hen to be consistently trampled underfoot by the others. Hens have a strong need to lay their eggs in privacy, an urge shown in studies to be as strong as the urge to eat after being starved for a day. Of course, privacy is completely impossible under these conditions. Other urges, like dust bathing and nesting, are also completely frustrated. In time, the rubbing of their bodies against the wires causes their feathers to fall out and their skin to be rubbed bright red and raw. Under these conditions of extreme stress and frustration, the chickens frequently peck each other to death. Farmers deal with this loss to profitability not by alleviating the conditions which lead to such behavior, but by cutting their beaks with a hot knife. This is not a painless procedure like trimming nails, since the birds have sensitive nerves in their beaks, and indeed for some chickens this creates so much pain that they cannot eat and thus starve to death. Conditions are so bad for these layers, 20-25% of them die before they are killed at less than 2 years of age. By the time they're killed, due to confinement and transport, 88% of the hens have broken bones. Fortunately, substitutes can easily be found for any recipe that calls for eggs. And vegan and vegetarian substitutes for the flesh of chickens can now be found in many supermarkets.